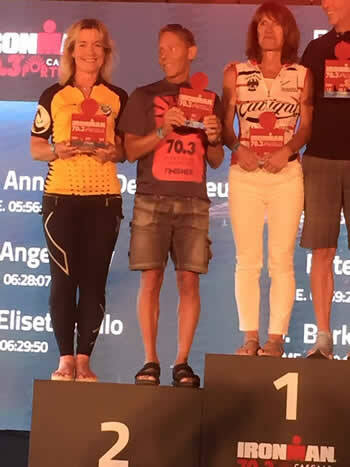 IRONMAN 70.3 Cascais in Portugal is an amazing race. 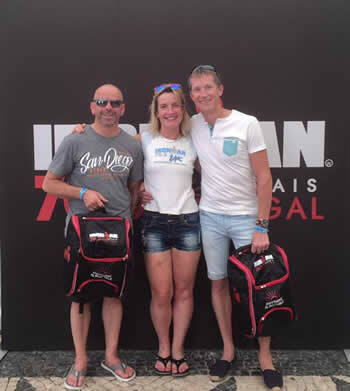 4 of us arrived to the Portuguese heat and sunshine, checked into our apartment and then off to register. It was a 500m walk downhill to the very pretty town centre with some cobbled paths and roads. The beach was full of sunbathers but not many in the cool Atlantic sea. Registration done, more back packs to add to our collection and then into the merchandise shop and of course a few purchases. We found a small supermarket to get supplies for race day breakfast, chocolate milk and water. Lunch was the local grilled sardines and a few beers. Back to building bikes and then off to the pasta party. Sacha and I were in our dresses and it started to get windy on our walk there and it continued to get worse and much colder. It is such an emotional moment when the music starts and the video presentation begins, you are drawn into the world of IronMan - this is what we have trained for! On Saturday we went out on our bikes to see if we could find the course and its hills, we found some but actually went up the race course descent. Off to the English briefing and left Sacha on the beach. We all took note of the ups and downs, how to enter the F1 race track and save our legs on the first part for the hills that follow. They did forget to say that the run was hilly too!! We were told that we could not rack our bikes on Saturday as they were expecting more winds coming in and didn't want us to worry about our bikes. We met Sacha on the beach for a swim in the sea and managed to swim round a boat without it being too cold. Race day morning up in the dark, breakfast and then bikes and bags ready for the off. Walking to the start was quiet and all thinking about our race plans. We had quite a long wait after racking and it was cool, wet suits on and the sun was rising giving everywhere a warm glow. On the beach into out time pens - BANG - a canon went off for the start of the pro men then again for ladies and another for us lot. Great start, 4 athletes every 5 secs, very safe, not scary, no washing machine effect just similar swimmers around you. We did an Australian exit on the next beach, back into a choppier sea and the exit was rather slippery up the slipway but lots of helpers. A very long transition, didn't help that I went the wrong way! Out on the bike ride, a bit cool but soon warmed up on the 'flat' part out to Lisbon, saw their Golden Gate Bridge. It was great fun going round the F1 course and then onto the hills - hills and wind - but what an amazing course, never a dull moment. At the top of the biggest climb there were loads of cyclist cheering us on our way, great support for us having ascended 600+ metres. Then the best bit a long steady descent back into Cascais along the coastal road, great waves and views and a big thank you to the crews who had been out sweeping the sand off the road. Shoes on and the only the run to do 13.1. Straight into a feed station, very welcome, down the hill and through the town centre with lots of supporters and cheers, up and out, up and round, up and down, get the picture, only 200 metres of climbing! Great run course with showers, feed stations and young lads ready to soak you in water as temperatures had soared to 30+. It was also great to see Gary and Mark on the course, last 5 miles were pure effort from me and all worth it for 2nd place in my age cat! We all would definitely go back and do this race again maybe it will go full distance in a few years? !